Why call a Hindley pub after Lord Nelson. Good pic of a good pub.You're a long way from home with this one aren't you Alan? Looks a decent pub. Never patronised it...another on my list to visit and sample their Bellini! Mick if you look at history and the time this pub was refurbished you will find out why. Well you would, Giovanni! It's your surname! A good photo of an excellent pub - of which our town is running tragically short. One of my favourites on a sunny summer's evening - the gentle smack of bowls from the green at the rear and an ice cold pint of cider .... Ahhhh !!!! 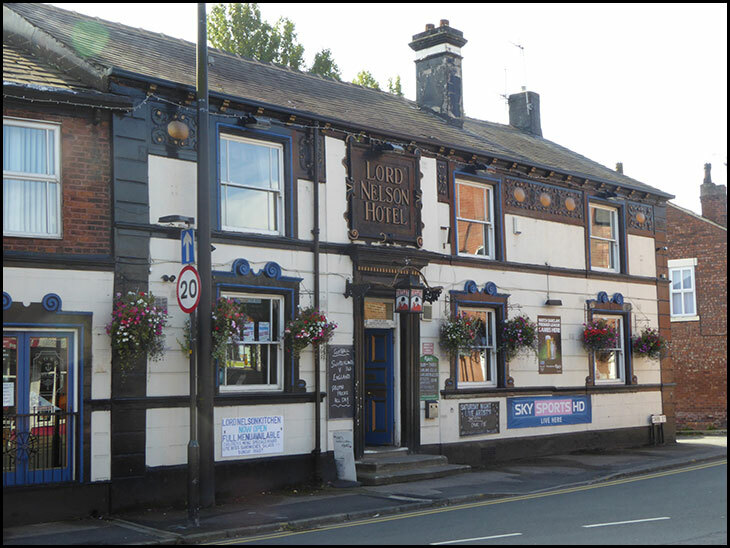 Just to make things more complicated there were two Lord Nelsons in Hindley.The other waqs situated half way up Castle in road.Locals called them Top Nelson and Bottom Nelson.Top Nelson closed in the 60s and was bought by LE Agency owned By Bill Leyland. Remember those lights Peterp, it was so funny watching folks as they came in trying to brush off the white flecks from their clothes with their hands. A game of bowls on a warm summer evening and a cold pint for company. A Bellini doesn't go somehow! Thanks for that delightful scenario Aubrey/Marcus. Ann21, you can take photos from anywhere as long it's got the Wigan connection. The top Nelson was called " The Admiral Lord Nelson"
Every time I hear 'All the young dudes' or 'Layla', I think of that dark room in the 'Nello', as we called it. A visit may be overdue. Not been in there, must be nearly 40 years. The top Nelson was called "The Lord Nelson Inn" and the bottom Nelson is called "The Lord Nelson Hotel"